Brain masala/ spicy brain/ maghaz masala/ মগজ ভুনা is a wonderful rich dish. The delicious lamb/ mutton/beef brain is cooked with spice. I am feeling hungry even to remember that. Enjoy the taste of brain masala with roti, paratha or rice. 1. Cut the brain into small pieces. 2. Heat the pan with oil. When oil is ready, add bay leaf, cardamom, clove and cinnamon. 3. Add sliced onion and fry it till it becomes soft. 4. Add turmeric, ginger, garlic, chilli, coriander, onion paste and salt and stir them about 2 minute along with 2 tablespoon water. 5. Add the milk and cook it about 6 minutes under closed lid. 6. Add the brain and cook 6-8 minutes. Stir occasionally and mix the brain with masala thoroughly. Check the salt. 7. 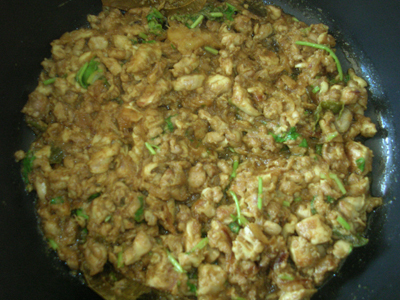 Add the coriander leaves and stir it. Turn off the heat. Brain masala is ready to serve. 8. Serve hot brain masala with roti, paratha or rice.